Mount Charleston, the highest point in the area, the town is in a valley of the Spring Mountains to the northwest of Las Vegas, noted for the Mount Charleston Lodge, a rustic hotel. Temperatures are from 20 to 30 °F lower than in Las Vegas, making it a popular place for Las Vegans to escape the heat. Mt. Charleston's Wilderness is an inspiring place with invigorating mountain air, ice-cold springs, and acres of noble evergreen forests. The rugged mountain scenery extends across the crest of the Spring Mountains and includes towering crags, deep and wide canyons, narrow slot canyons, and steep hillsides. It includes Fletcher Canyon, Robbers Roost, and Mummy and Trough springs. Mt. Charleston is knows as a "Sky Island" because of its high elevation and isolation from the drastically different desert lowlands. Elevations range from about 4,440 feet on the lowest slopes in the southwest part of the wilderness area, to nearly 12,000 feet at the summit of Mt. Charleston Peak, the highest elevation in the Spring Mountains. 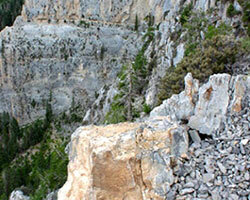 The Mt Charleston area also provides hiking and biking trails, breathtaking waterfalls and various high desert wildlife. In the winter there is skiing, sledding and all around winter fun. Also in the area is atomic testing history where you can safely view where atom history was made on the Nellis Air force testing base from the 40's to 60's. Note: This tour has a maximum 5 hours in duration starting from your hotel. 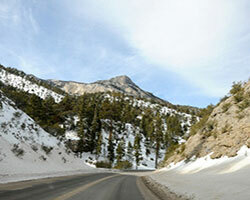 This tour is one way to and from the Mount Charleston with one photo stop. 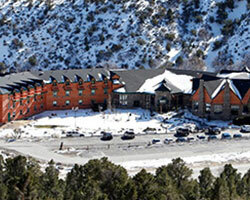 There is a one hour stop at the Mount Charleston Lodge. If more time is needed then we will charge in 30 minute increments.